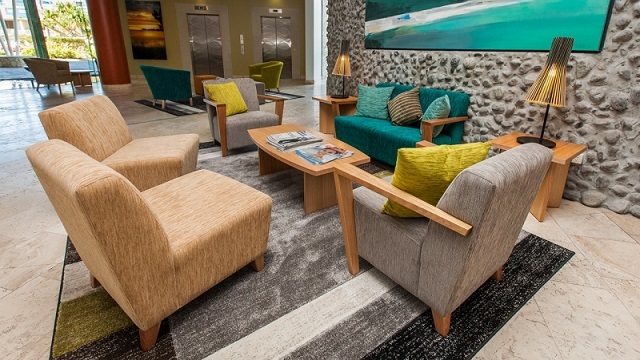 Choosing hotel furniture can be an overwhelming task. With so many different styles and types to choose from, it can be difficult knowing where to begin. Nextrend offers a wide range of styles to suit all establishments. Customised upholstery allows us to tailor each order to fit your business, ensuring a completely unique design. Cruza stool: Created in Australia with a fully welded, stainless steel frame, the Cruza stool is suitable for both indoor and outdoor use. The moulded resin Duratop stool top is available in a wide range of designs. Offering a seat height of 750mm, the stool provides a sophisticated and modern design. Club chair: The armless Club chair is part of our Modular range and it is a fully custom made product. Australian made, the chair comes with a solid timber frame for maximum durability. It features Dunlop Enduro foam and is available in a huge choice of fabrics. Club 2 Seater: Our Club 2 Seater is a larger version of the Club chair and can be ordered with or without arms. With Dunlop Enduro foam and a solid timber frame, this high quality sofa chair is also part of our popular Modular range. It is custom made to fit each individual business and comes in a wide range of fabrics. Club Armchair: Another addition to our Modular range is the Club Armchair. Choose from a huge selection of fabrics with this comfortable, deep seated custom made design. This armchair is also available without arms or as a 2 Seater sofa. Gina Tub Chair: The superb quality Gina Tub Chair is another of our custom designs. Allow your customers to relax in comfort with this Dunlop Enduro foam filled chair. There is a large choice of fabrics to choose from and its solid timber frame ensures it really stands the test of time. All of the pieces above were tailored to suit the preferences of The Sebel Maroochydore Hotel. 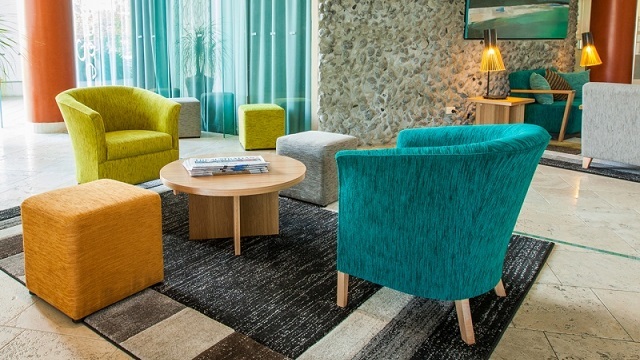 With the huge selection of fabrics available, creating a unique look to suit your establishment has never been easier. We aim to provide truly unique results for each one of our clients. You may view more information and images of the Sebel Maroochydore Hotel project here. Not sure which design is right for you? Our team can help. Guiding you through the process, we will ensure you end up with the best hotel furniture to suit your needs. Transform your venue with our excellent range of commercial furniture. All of the products we offer are guaranteed for 2 years. We’ll provide fast, efficient service at unbeatable prices. We have a large stockholding of products, ensuring quick delivery. Whatever style you are hoping to achieve, we have a product that is just right for you. Contact our friendly team today to discuss your requirements and we will provide a free, no obligations quote.